In recent decades, there has been a tremendous push by the healthcare field to discover and develop new diagnostic and treatment options to improve the survival rate of various diseases. Perhaps no disease process has received more attention than cancer. For those who don’t know, cancer develops when cells develop, replicate, and proliferate out of control. As these cells grow, they start to press on other vital organs that start to fail. It is this organ failure that ultimately leads to the decline of someone’s health and eventual death. There are many different types of cancer and one type that is often overlooked is skin cancer. For many people, this skin cancer starts as a small mole. Some people may not pay much attention to it until it grows, proliferates, and causes systemic health issues. 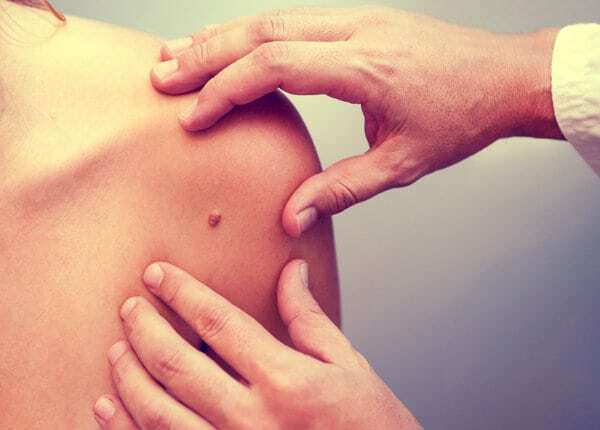 Because of this, it is important for everyone to understand what a precancerous mole looks like and how to differentiate this from a typical mole. A mole is a common, small, brown spot that lives on the surface of the skin. A mole can be termed “atypical” if it varies in appearance from a standard mole. Many people have moles on their body that they are used to seeing on a daily basis. Some individuals may even decide to have these moles removed for cosmetic reasons; however, this procedure is very different from the removal of a cancerous or precancerous lesion. Moles vary in shape and size; however, most of them are round, slightly elevated, and regular in shape. There is a thought that moles develop because of sun exposure. It is important to note that these moles are not precancerous lesions. There are different causes of skin cancer and many of these involve sun exposure. When people are exposed to the sun, the ultraviolet radiation often damages the DNA of the skin cells themselves. As the DNA is damaged, the cells are unable to produce proteins and cannot correctly respond to the various signals of the body. As a result, they divide out of control and lead to the symptoms of cancer. Therefore, it is important to spot a precancerous lesion before it gets too big. 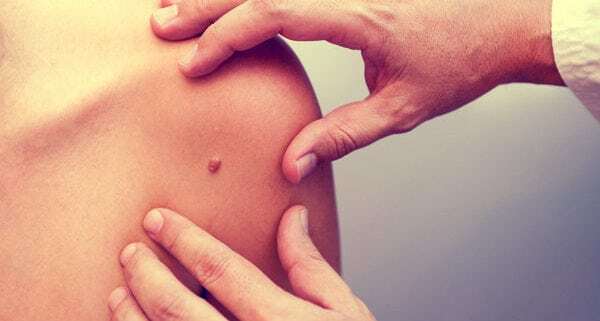 What are the Signs of a Precancerous Mole? Remember that a common mole is typically symmetrical. It is round, sometimes elevated, and shaped evenly. On the other hand, precancerous skin lesions are asymmetrical. Often, they have irregular, confusing shapes. This means that if someone were to try to cut the lesion in half, the sides would not match. Along the lines of asymmetry, it can be a challenge to tell where the borders of precancerous skin lesions are. This lesion often blends with the rest of the skin and the borders of the skin lesion are blurred. Often, they are described as hazy because the precancerous lesion blends and fades into the healthy skin. Most people know that the standard mole comes in a few standard colors. They are often tan, brown, or the color of the skin; however, they pick one color and they stick to it. A precancerous skin lesion often comes in multiple colors and even a single lesion can have subtle, confusing colors. Examples of common colors include brown, black, red, and blue. A multicolor skin lesion is concerning for cancer. The larger the lesion is, the more likely the lesion is to be precancerous. The standard mole is typically around five millimeters or so. If the lesion is larger than this, it needs to be evaluated. Even if it isn’t ultimately a form of skin cancer, it may still cause health problems that deserve the attention of a professional. Lastly, any lesion that is getting larger should be evaluated by a health professional. Moles develop in the early years and stay the same size. If the skin lesion is getting bigger, it must be examined. Furthermore, people who notice a new mole in their later years should see a doctor. If there is concern that a skin lesion is precancerous, a doctor should take a look at it. In some cases, the lesion may need to be biopsied and placed under a microscope for more information. Special stains can be used to try and differentiate a mole from a skin lesion. If the lesion is deemed to be cancerous, various treatment options can be discussed. In some cases, cancer can be removed in its entirety in a single setting. In other cases, surgery may be used in combination with chemotherapy and radiation to kill the cancer cells. Radiation is also used as primary treatments for some non-melanoma skin cancers. This decision should be made in conjunction with a cancer specialist. In the end, it can be difficult for people to tell the difference between a simple mole and a precancerous skin lesion. Because of this, it is important to conduct a detailed skin exams regularly. If there are any questions or concerns, schedule an appointment with a trained health professional.